Imagine plucking fruits from a tree, tossing them in with your dirty laundry load, and pulling out fresh clean laundry! That is exactly what soap nuts offer. This Himalayan fruit from the Sapindus Mukorossi tree is filled with saponin, which is a natural detergent and foaming substance that lifts grease, dirt, and grime from clothing. Turns out, soap nuts aren’t just good for cleaning clothes, however. They’ll clean just about everything in your home… even your dog! And relative to the other options on the market, soap nuts are a better choice for the environment. You can use the soap nuts whole, as when cleaning your clothes. You can make a soap nut liquid by boiling 20 soap nuts with 4 cups of water and straining the liquid. This liquid requires refrigeration and keeps for one week. You can make a soap nut paste by boiling soap nuts and then grinding them in the food processor. You can make a soap nut powder by grinding the soap nuts finely. Note of caution: Never ingest soap nuts or get them in your eyes. Always label appropriately and keep out of the reach of children and pets. These 4 soap nut preparation methods are all you need to start sanitizing everything from your tub to your hair, your dog, and jewelry! Soap nuts are typically sold as laundry-cleaning agents. You take 4-5 nuts, place them in a cotton bag, and toss them in with your laundry. We love using soap nuts to clean our clothes! While they are effective zero waste cleaning agents, they aren’t ideal for filthy stained clothes or cloth diapers. If you’re washing whites, we recommend adding 1 tbsp. sodium percarbonate per load. If you would like to add a nice scent to your laundry, we recommend adding essential oils such as lavender from Aromatics International. Soap nut liquid can be used as a multi-purpose cleaning agent. It can be used in a spray bottle to sanitize kitchen surfaces. You can add it to your toilet cleaner bottle to clean your toilet bowl. This liquid can also be used to clean your floors. This liquid will clean most surfaces, so get creative! Soap nut paste can be used as a scouring paste to scrub bathtubs, windows full of soot, or oven doors. Simply grab a homemade tawashi sponge or a luffa sponge to start scrubbing! You might need some elbow grease, too. Soap nut liquid can be added to a spray bottle and sprayed on your windows or on glass to make windows squeaky clean. Using newspaper to clean your windows is an effective way to minimize streaks. Since soap nuts don’t create excessive suds, they work really great as window cleaners. We prefer this window cleaner to vinegar, for sure! The soap nut liquid can be used to clean your dishes, but it would need to be stored in the fridge or mixed with ingredients that would help the soap last longer (such as vegetable glycerin and Castile soap). Alternatively, you can use soap nut powder to make dishwasher soap. You would use citric acid, washing soda, and soap nut powder in equal volumes. This recipe is similar to one we use in our Conscious Cleaning 101 course, where we use grated Marseille soap or Castile soap instead of soap nut powder. Soap nuts are excellent carpet cleaners. Using the liquid in a portable cleaner, for instance, will not only clean the carpet but also cut bad odors. If you’re cleaning your carpet by hand, make sure to aerate afterwards to dry appropriately. Jewelry that needs reviving can be soaked in soap nut liquid, then scrubbed with a soft brush. This also applies to kitchen metals that have lost their shine. We were really impressed with this soap nuts recipe! The soap nut liquid can also be used to clean your hands. Like Castile soap, this soap nut liquid isn’t very fatty, however, so it may dry out your hands over time. I would use this as a temporary or occasional solution only. Cristina raves about this soap nut hand sanitizer! The cleaning properties of soap nuts are safe for natural skin care and hair care. You can wash your hair and body with soap nut liquid (and extra vegetable glycerin to make it thicker! ), or even just scrub your body with a handful of soap nuts. It will leave your hair and body feeling soft, but may dehydrate your skin over time. We don’t recommend this for folks with dry hair. If you don’t see as much suds as you’re used to, it doesn’t mean the fruit aren’t doing their job. Keep on cleaning! Soap nut liquid is also safe to use on your pets to give them a good wash. As with any soap, refrain from using the soap near their face where it may get in their eyes. (You might want a stronger liquid if your pet is totally filthy.) Rinse well and enjoy your fresh pet! Now that you’re a pro on the topic, you may wonder where to buy soap nuts! You can find soap nuts in your local health food store or online with NaturOli. We love NaturOli because they offer organic, plastic-free bulk options too. All students from our Conscious Cleaning 101 class receive a 20% discount off NaturOli soap nuts. Will you be giving these soap nuts a try? Will you be making your own liquid, paste or powder? If you want to keep learning ways to reduce your waste, you can also check out our free Intro to Zero Waste Living class. If you enjoyed learning about cleaning with this saponin-rich plant, you might enjoy learning about our English Ivy Laundry Detergent or our Horse Chestnut Laundry Cleaner. I hope this inspires you to get creative with your zero waste cleaning products and to make your home a safer place! Do you want to clean your home effectively & affordably with nontoxic & eco-friendly DIY products? 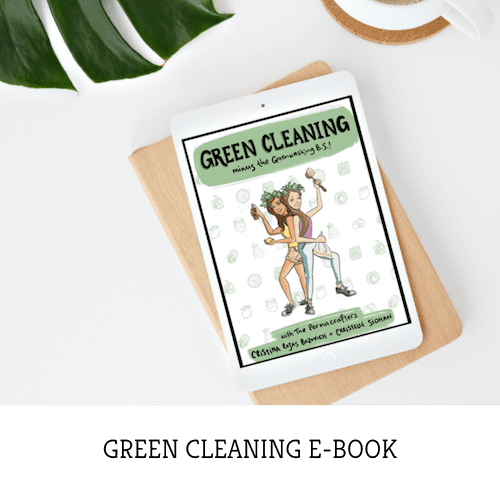 Learn about Conscious Cleaning 101: An online Green Cleaning workshop minus the Greenwashing B.S.! Apply Self Regulation and Accept Feedback – Opting for soap nuts is a great way to step away from toxic industrial cleaning products and prioritize your health and the planet’s health. Use and Value Renewable Resources and Services – Nature is abundant in plants that are rich in saponin. Soap nuts amazingly produce their fruit the majority of the year. They are a wonderful renewable resource that allows us to reduce our depending on non-renewable cleaning products often found in stores. Produce No Waste – Soap nuts are a great zero waste cleaning product choice. So long as you opt for a company that grows organic soap nuts and refrains from using plastic packaging, you’re in good shape. The one notable waste soap nuts produce are carbon emissions, since they require shipping from quite a distance. However, as compared to other products whose emissions from mining and lab processing are very high, soap nuts are a responsible choice. Use and Value Diversity – If you’re a zero waste cleaning pro, you might prefer to use saponin-rich plants that are local to you. Go ahead and sign up to our Resource Library to claim your free guide on cleaning with 10 saponin-rich plants. You can also check out our posts on English ivy detergent, wood ash laundry cleaner, and horse chestnut laundry detergent.